In Montana, a trustee uses a trustee's deed to convey property held in a living trust. This trustee's deed is different from a trustee's deed to the purchaser at the trustee's sale. A living trust is an estate planning tool that allows the trust maker to determine what happens to their assets upon death. The living trust relationship involves three parties: the settlor (trust maker), who establishes the trust and funds it with assets (including real property); the trustee, who holds title to the property on behalf of the trust; and the beneficiary, who has a present or future interest in the property held in trust. The settlor is able to revoke a living trust up until his death, at which point the trust becomes irrevocable. The trust is established by a trust instrument executed by the settlor. The instrument names the trustee -- whether an individual, multiple people, or a corporate trustee --, the beneficiaries, and the trust's terms or provisions. Because the trust cannot technically hold title, property transferred into it is titled in the name of the trustee on behalf of the trust. The trustee's power to convey trust property is codified under the Montana Uniform Trust Code at 72-38-816(2). 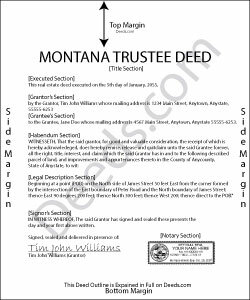 In Montana, the trustee's deed is a type of quitclaim deed, and so contains no warranties of title. The deed names the acting trustee as the grantor, the trust's name and the date of the instrument establishing the trust, and, after recording, transfers title to the grantee. The document should meet all requirements of form and content for documents affecting real property in the state of Montana, including the legal description of the property being conveyed. The trustee must sign the deed in the presence of a notary public before recording. If the recipient of a trustee's deed requests it, a trustee may also confirm his authority to enter into real property transactions by providing a recorded affidavit under Mont. Code Ann. 72-38-1111. Contact an attorney with questions regarding living trusts and trustee's deeds in the State of Montana.